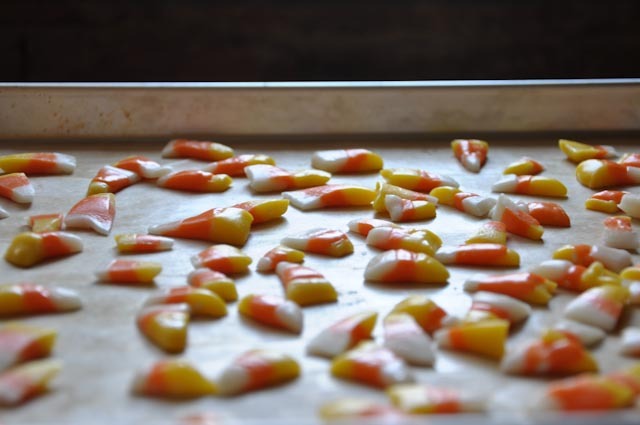 I’ve tried a lot of recipe’s for Candy Corn – and they all seem slightly off to me. So here is mine. Food coloring – Orange (or red and yellow) for traditional. Fancy icing color, candy coloring, or the regular grocery store stuff all work fine. Sift together Confection Sugar, Dry Milk, and Salt. Or you can food processor it – but I think sifting works better. Put try ingredients in a medium to large glass bowl (it helps hold heat) – and create a crater in the middle – push the dry ingredients up around the sides of the bowl. Add the butter. Dissolve and stir till it starts to bubble. Put the candy thermometer in. Immediately add vanilla and pull from heat. Pour quickly in to the try ingredients. Using the spatula mix the dry into they syrup. Keep mixing till a dough starts to form. Use your hands if you can stand it. Don’t worry if not all of the dry can mix in if it starts getting to stiff. Cover the bowls you’re not currently working with with plates or lids to keep it warm. Do the yellow first – add a few drops at a time while kneading it in till you’re happy with the color. Cover the bowl. Next do the orange – usually 3 drops yellow to 1 drop red. Then do all the orange – pressing the orange snakes up against the yellow. Make the orange snakes/ropes slightly smaller than the yellow. Change the latex gloves or wipe off any food coloring so that the white stays white. Make the white snakes, and press against the yellow-orange ones. You’ll now have long ropes of candy corn. Cut them into triangles, I usually alternate the angle. Lay out the pieces on the sheet pans, and let air dry for a couple hours. Seal in bags. Or just eat it all yourself and don’t tell anyone you even made them. You don’t have to make them look like candy corn – try vampire teeth (white and blood red) – or for your extra weird friends – eyeballs.